Everything from the average salary, the number of people in the different salary ranges, the number of rentals, and the number of owner-occupied properties, the race, the origin of birth, how many people are on government subsidies, how many people are handicapped, the basic industries in selected municipality. There are all kinds of data that is very, very valuable to you to determine which areas you want to invest in. For me,when I am buying multi-unit rentals, I like to be in an area where it is two-thirds rental properties and one-third owner-occupied properties; that is a good solid rental area. 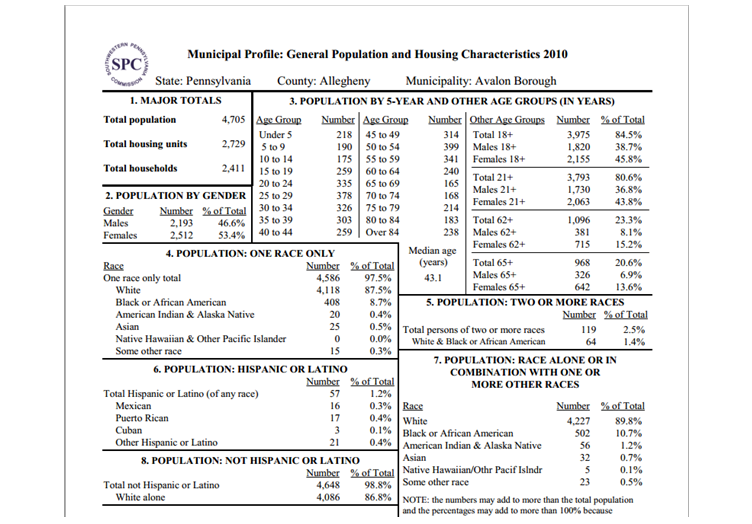 These demographics are typical for good C-grade and B-grade properties, and possibly some As. But the A-grade areas will typically be two-thirds owner-occupied and one-third rentals, more expensive, harder to come by, and they will not cash flow nearly as well. get anywhere from $800 to $900, even up to $1,000 per month rent. On A-grades you can go well over $1,000 per month. Remember that certain areas of the country are very, very expensive, such as Santa Barbara, California, Laguna Beach, La Jolla down in San Diego, and of course Malibu. It is really difficult to find nice properties you can actually afford and that will cash flow. However, other areas in the country are really good for investing. Right now, western Pennsylvania is great, particularly Pittsburgh and the Allegheny County area. St. Louis, Missouri is also great. Several areas around Atlanta, Georgia; Macon, Georgia; and several areas in Florida, like Jacksonville are good. Several areas in North Carolina, one or two in South Carolina, and Hampton Roads, Virginia (they call it the seven cities or tidewater area) are still great for investing. These areas are still digging out a lot of bank inventory. Other places are turning around. In western Pennsylvania about ten years ago I was able to find about 3,000 bank foreclosures in a certain price range, in a population of about two million people.Today I can maybe find 300. Down in Hampton Roads—specifically the area around NASA, Langley Air Force Base, and Newport News in Hampton and Yorktown—population is well under a million, maybe 800,000 there; but I also found almost 900 foreclosures and short sales.That is pretty awesome for our purposes. Properties are a little bit more expensive there, but there are some great deals right now. So wherever you are in the country, never fear.Use that region’scensus data to narrow things down to the specific towns and municipalities you are going to invest in. You will thank me for that. Why would you put more money into a place where somebody is already happy and paying you rent? Now granted when they move out if you have an opportunity to improve the property, within reason—like new carpeting, fresh paint, perhaps some new door and drawer knobs, maybe some bathroom upgrades—great, but only if it returns a profit. Will the upgrades allow you to raise your rents? I believe that every dollar I spend must be held accountable for another dollar of income. I do not just improve something because I think it needs to be improved; it has to result in net positive cash flow to my pocket. You need to think this way, like a business. Do not treat this investment like you are buying a stock or a bond, where you just watch it do whatever it does, and hope the people are running the company properly and you’re not going to lose your shirt.You are running this company.Youmanage these properties, own them, and you control them. By the way, real estate is far more forgiving than the stock market ever will be. In real estate, you have more time to recognize trends and react to them; it is a slower moving market. That is why I like it. But in any case, some areas may not be strong home-ownership areas, but they might be strong rental areas, and that is what we are looking for.You always want to be in neighborhoods that are near schools and shopping, bus service, parks, major highways, hospitals, and of course municipal services like fire and police. Generally speaking, it is great to be near schools and parks, even across the street. Now you do not want to be right on top of fire and police stations or hospitals. You want to be several blocks away, for obvious reasons. Shopping and public transportation can be down a block or two. Again these are just guidelines.If it is a strong rental area, you can be several blocks or miles from shopping and public transportation. But the more of these characteristics you have the more profitable you are going to be… because you will always have people wanting to rent your places… and you will never have vacancies. Once you have narrowed down the areas you want to look in, you should start looking at the actual neighborhoods within those geographic areas. I look for places with tree-lined streets, wide enough for on-street parking, neighborhoods where people are cutting their grass, and are perhaps even planting flowers. There are a lot of examples of this that I can think of, but essentially you do not want to be in a war zone. As homework for this module, I want you to use the links above, put them in your browser, save them to your favorites, visit those websites and see what they have to offer. Narrow down your search, even if you are already investing in an areaand use those tools to see what other areas around you could be a good investment. You do not always have to use other people’s word for it.Do your own research. You know the old saying, “Trust, but verify.” Trust what other people are telling you, but verify it with your own analysis. Use the tools I gave you and I promise you will be happy.